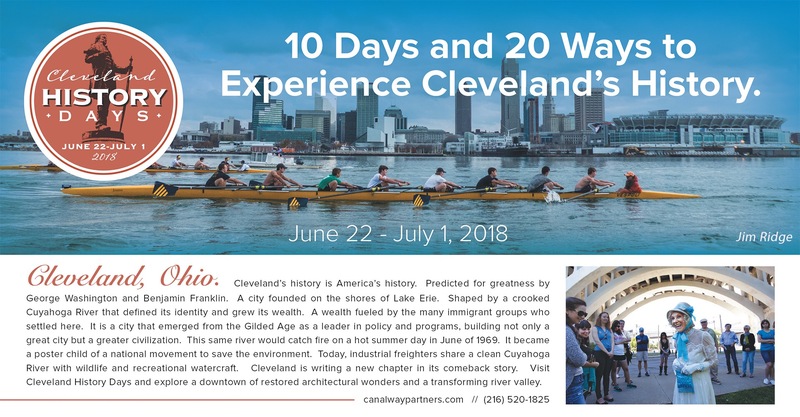 Cleveland History Days kicks off on Friday, June 21st with a short opening ceremony and the Burning River Festival at the old Coast Guard Station on Whiskey Island and concludes with the closing ceremonies on Sunday, June 30th at the 2nd annual Kupala Ukranian Heritage Festival in Tremont. There are a variety of events and activities planned for the duration that include the 40th annual Tri-C JazzFest, Blazing Paddles on the Cuyahoga River, Author’s Night at the Music Box Supper Club, a program about the 1995 Cleveland Indians at the Baseball Heritage Museum at League Park, the annual tour of the Detroit-Superior Bridge, walking tours and bike tours throughout the downtown area and two open houses at Midwest Railway Preservation Society. The complete list of events is listed here. Note – some details are still being ironed out, so check back. Blazing Paddles is a standup paddleboard, canoe & kayak celebration held on the Cuyahoga River, a historic body of water that’s risen like a phoenix from its ecological low-point in 1969. You’ll be on a curvy, 5.7-mile urban course that flows past a unique mix of riverfront sites where iconic pyramids of sand and stone stand in contrast to paved paths and green-spaces. The scenic course with sweeping views of downtown Cleveland will take you under 10 bridges spanning the river before you reach the turnaround point – THE location of the 1952 Cuyahoga River fire, the infamous image that’s often used as a visual stand-in for the much smaller June 22, 1969 fire. There is also a 2-mile event for casual paddlers. Meet @ Rivergate Park, 1785 Merwin Ave.
University Circle is easily accessible by public transit and bike. Look for the flower shaped bike racks in front of the Cleveland Botanical Garden. If you don’t have a bike, consider bike share through UHBikes. The nearest UHBikes station is on Wade Oval in front of the Cleveland Museum of Art. Street parking is available along Wade Oval Drive, East Blvd and Magnolia Drive. The Cleveland Museum of Art, Cleveland Botanical Garden, Cleveland Museum of Natural History and Cleveland History Center all have parking garages nearby. For more information about getting to and around University Circle, please visit ugointhecircle.com. Meet @ Wade Oval Information Center: 10820 East Boulevard. Join dignitaries in ceremonies for final stage of the Towpath Trail and new Northeast Ohio Regional Sewer District Pump Station. Meet @ in front of the Flat Iron Cafe, 1114 Center St. In less than an hour, take a walking tour uncovering 222 years of history along the perimeter of Public Square. You’ll learn about astonishing historical events that took place in this small, less than 10-acre plot of land! Stand on the same land that animals used for pasture; where Presidents were viewed as they lie in state; where tall architectural towers were built and others imploded; and where street lights illuminated a city for the first time anywhere. Also, where Cleveland, against all odds, became the best location in the nation! “Storytellers” featuring local authors Laura DeMarco, Lauren Pacini, John Grabowski, and James Bedol. Doors open @ 5pm, dinner, drinks. The event is free, but reservations are recommended. Meet @ Music Box Supper Club 1148 Main Ave. Featuring content they have regarding the Cuyahoga River and its clean up: in their collection and through two current exhibits: “Cleveland Starts Here” and “Carl & Louis Stokes making History”. Guided tour of the Main Branch of Cleveland’s stunning, historic library which was founded in 1869. This Cleveland treasure boasts amazing architecture, awesome book collections and a wonderful staff! The tour will take visitors through the Main Library and the TechCentral (MakerSpace) in the Louis Stokes Wing. Visitors will also enjoy the terrific Puppet Exhibit underway. Learn about the historic and beautiful Old Stone Church, the Free Stamp, Cleveland’s unique public art piece, and Veterans Memorial Plaza with its striking fountain. You’ll be amazed at both the grand architecture and the green spaces of the Civic Center as you stroll past the Board of Education Building, Public Auditorium, Cuyahoga County Courthouse, the Cleveland Convention Center, the Global Center for Health Innovation and much more. Architect Daniel Burnham, Coach Paul Brown, the first coach of the Cleveland Browns, and/or Librarian Linda Eastman will be featured on this tour. Cleveland once boasted of its Millionaire’s Row where some of the nation’s richest people lived. Meet @ the Mather Mansion, 2605 Euclid Ave.
Admire breathtaking architecture as you learn about the historic Garment District, hardware industry and beautiful Victorian-style buildings of Cleveland’s First Neighborhood. Learn about Warehouse District projects and the beginning of preservation efforts in Cleveland. Home to fabulous restaurants, a vibrant nightlife and close to 3,000 residents, the Warehouse District is a charming and lively neighborhood. Tour attendees may have the pleasure of meeting John D. Rockefeller or Levi Johnson along the tour route. Plan to visit one of the Warehouse District’s renowned dining establishments or bars while you are in the neighborhood. Convenient street parking and parking lots are available along West 9th Street and West 10th Street. The tour will take visitors through the Main Library and the TechCentral (MakerSpace) in the Louis Stokes Wing. Meet @ the lobby of the Main Library, 325 Superior Ave. The Cleveland History Days Historic Preservation Showcase will tell the story of the Superior Avenue Historic District. This unique arts district is on the east end of downtown north of Cleveland State University. The current redevelopment has used multiple historic preservation tools including the federal and state historic tax credits as well as historic conservation easements. Tour will include stops at multiple historic structures showcasing development in arts, commercial and residential projects. Key projects complete in this district include: Tower Press and GBX Headquarters, a future potential historic rehabilitation in the Artcraft Building. Topics to be covered include the process through which these tools are accessed and applied to historic adaptive reuse projects, potential challenges in their implementation, and common misconceptions about the programs. A reception with complimentary beer, wine and light hors d’oevres will follow the tour, allowing for more casual follow-up discussion with speakers and other participants. Attendance limited to 75 people. AIA Continuing Education: 2 hours of HSW Learning units. Sponsored by Historic Gateway Neighborhood Corporation, Co-Sponsored by AIA Cleveland and Cleveland Restoration Society. Meet @ 2230 Superior Ave.
A one-hour walking tour uncovering 222 years of history along the perimeter of Public Square. You’ll learn about astonishing historical events that took place in this small, less than 10-acre plot of land! Stand on the same land that animals used for pasture; where Presidents were viewed as they lie in state; where tall architectural towers were built and others imploded; and where street lights illuminated a city for the first time anywhere. Also, where Cleveland, against all odds, became the best location in the nation! Learn about the Gateway District’s incredible architecture, such as The Arcade and the 5th Street Arcades, East 4th Street, historic dime stores, such as Woolworth’s and Kresge’s, the transformation of the Garfield Building, the story of Rose’s Folly and more. Home to Quicken Loans Arena, Progressive Field, six hotels, unique stores and over 60 restaurants and bars, the Gateway District is the most visited neighborhood in Downtown Cleveland. Mayor Tom Johnson or inventor Garrett Morgan may drop in for a visit along the way. You may wish to visit one of the Gateway District’s fabulous restaurants for lunch after your tour. Get guided tours of the site and learn how railroads helped make Cleveland an industrial giant. Climb on board an original, elegant “parlor coach” from the 1920s and hear the famous history of the “4070” locomotive. Event details and directions. 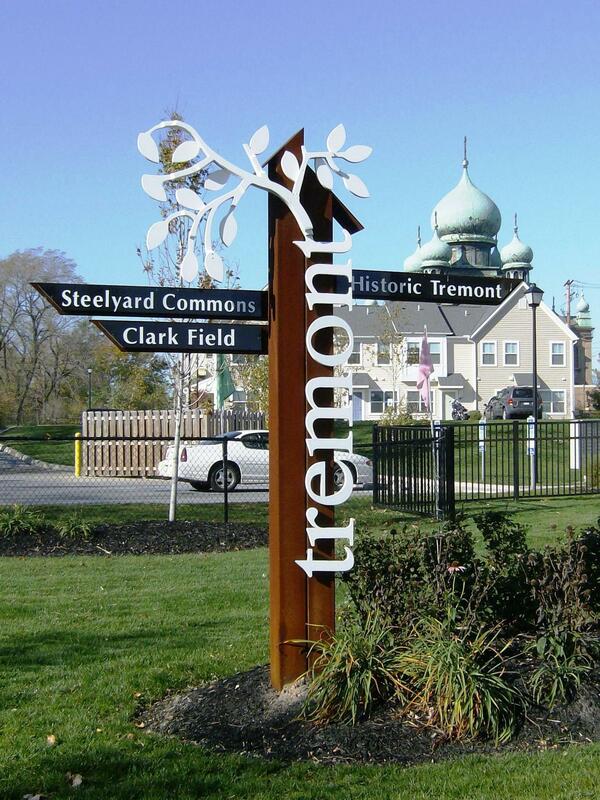 Kupala Ukrainian Fest is a celebration of Cleveland’s rich immigrant history, in the heart of where so many diasporas had their start: Tremont! Enjoy an assortment of authentic Ukrainian cuisine and beers, followed by two full days of performances by local and visiting musicians and dance collectives. The festival will benefit two local non-profit charities, the Ukrainian Museum-Archives and the Cleveland Maidan Association, creating a positive impact both on a local and global scale. $10 Adults, $5 Children 3-13, Children under 3 free. 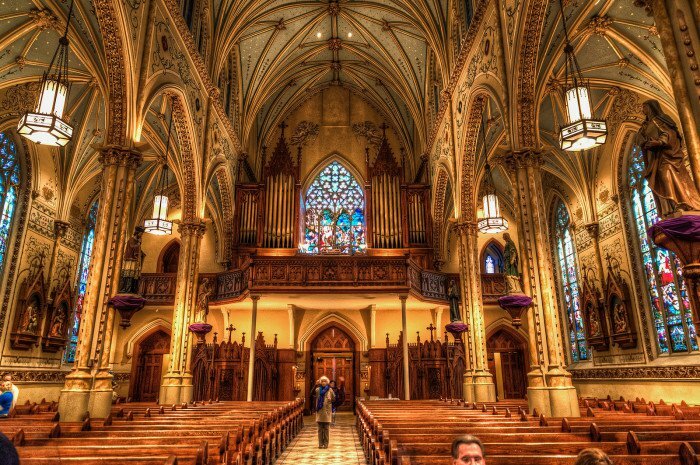 Fantastic opportunity to take special guided tour of the beautiful St. John’s Episcopal Church, whose legacy includes being one of the final stops for the Underground Railroad before slaves boarded boats bound for freedom in Canada. Meet @ St. John’s, 2800 Church Ave.
Jim will lead a cycling tour of the Cuyahoga River Valley – East & West, interacting with its rich history on streets and the emerging Towpath Trail Greenway. Family friendly for anyone comfortable riding in a group and in traffic. Helmets are required, and available to purchase or borrow at the start. Free event; donations fund bike safety education. Rental bikes, child trailers and trail-a-bikes available; contact info@OhioCityCycles.org or 216-830-2667 before 6/26. Spend 90 minutes hiking through Tremont and learning the history of immigration and industry. Winners of the first Cleveland History Buffs awarded – winners must be present.